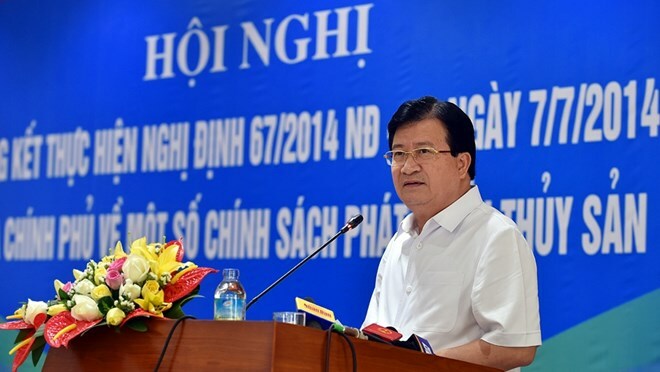 Hano​i (VNA) - Repairing newly-built substandard offshore fishing vessels is a matter of great economic, political and social significance that should be done immediately, Deputy Prime Minister Trinh Dinh Dung has said. Speaking at a conference held in Hanoi on August 1 to review the implementation of the 2014 Government decree on development of the fisheries sector, the Deputy PM asked central and local leaders to focus on removing its limitations. The Ministry of Agricultural and Rural Development (MARD) should review the fishing vessel registration process to ensure the ships are in good condition. Supervision of the shipbuilding process and the people involved should be stepped up, he said. He also wanted commercial banks to untangle loan procedures for fishermen. “Disciplinary action should be taken against individuals and organisations involved in the faulty implementation of the decree,” he said. The Deputy PM also called for changes to the decree that should be made public within the fourth quarter of this year and go into effect at the beginning of next year. Evaluating overall implementation of the decree in recent years, Deputy PM Dung said it was a groundbreaking, comprehensive policy that served the needs of fishermen and contributed to the development of the country’s marine economy. Under Decree 67 (dated July 7, 2014), ship owners building steel or ships with new material (other than wood) with engine capacities between 400CV and 800CV can borrow up to 90 percent of the total cost at the interest rate of 7 percent per year. Reports from localities show that under the Decree, ship owners in 27 of 28 coastal provinces and cities had borrowed money to build and/or renovate 1,948 – or 85 percent – of the total 2,284 fishing ships. By July 31, some 760 vessels had been pressed into service. Of these 460 were newly-built (301 steel-clad ships, 53 composite and 407 wooden) and 105 others renovated. Earlier in May, some 40 ships built in the central provinces of Binh Dinh, Phu Yen, Thanh Hoa and Quang Nam were reported to be in bad condition, their shells rusty, machines broken and equipment malfunctioning. Repairs of these vessels are expected to be completed by the end of next month. Deputy Minister of Agriculture and Rural Development Vu Van Tam said there were shortcomings in the selection of shipbuilding companies, design consultation and construction supervision, since it was the first time fishermen were taking part in building steel-ships. This time, MARD would oversee the repairs and bring the vessels back into operation as soon as possible, he said, asking fishermen to conduct periodical renovations and repairs.